Despite it not being a moving day today Mr Awesome was still awake bright and early and requesting us all to join him. I was again (as I am every morning) enticed out with the smell of coffee. Actually that is not quite true it is the sound of Billy whistling that prompts me to clamber out. Though I guess having a whistle to signal being boiled means Billy is actually rather a kettle than a billy but whatever, Billy is what he is called. The girls were drawn out by the excitement of heading to Echidna Chasm. Which is where we were planning to explore today. Essentially Echidna Chasm is walking between two big rock walls. Which at times can be a bit of a tight squeeze. 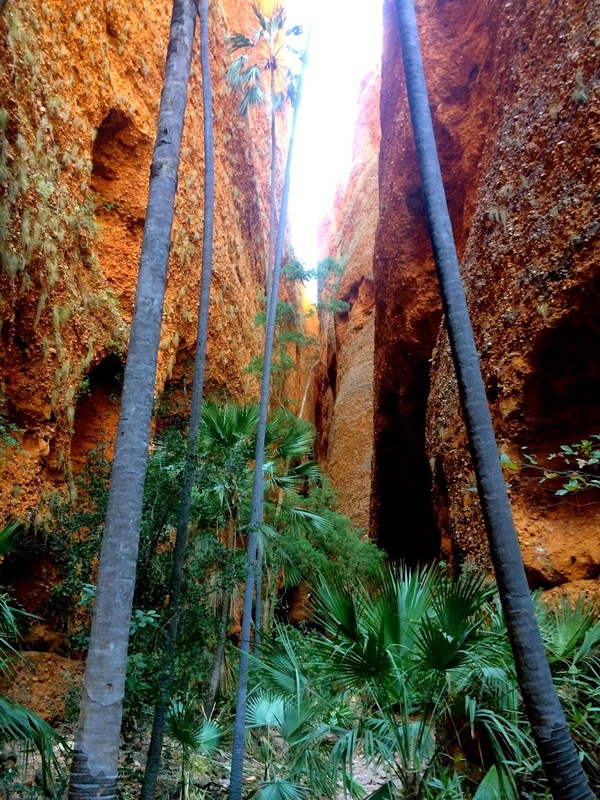 Echidna Chasm began forming some 360 million years ago through erosion of a fault in the limestone rocks. We have seen a few photos of the area and they were all nothing short of spectacular. Sadly I don’t have any spectacular photos of my own to share with you because I forgot to change the exposure settings on my camera. Live and learn though. Mr Awesome managed to take a few ok shots from his iPhone which is better than nothing. It is also testament to the awesomeness of the iPhone. It was also a vast reminder of how there is so much about my flash fang dangled camera I still don’t know. Despite proudly owning it for some six years now. Despite the lack of photographic evidence Echidna Chasm was a truly amazing place to see. The wonder in the girls faces as they took in the wonders of the rock walls was also pretty amazing and provided confirmation once more that this trip was a great idea. While most people seemed to just walk through get to the end and turn around to head home we hung about inside for a lot longer. The girls delighted in echoing their voices while we chatted to a few oldies that passed through. Where we stopped to have a bite to eat. At one point just before the end there is a rather large space with some bench seats. We decided to sit and have some lunch here and marvel at how little time so many others had to spend there. When we returned to camp that afternoon we were all a little worn out from our morning’s adventure, which meant it was a bit of free time all round. I used my free time to catch up on some reading. Hunger Games Catching Fire can now be added to my have read list. Yes a bit late to the party I know but better than never right? I must say that I was more than a bit surprised at how much I enjoyed reading it after being less than impressed with the movie version. I have books two and three with us as well but since the rest of the world ceases to exist when I read I am not sure when I will actually get around to reading them.